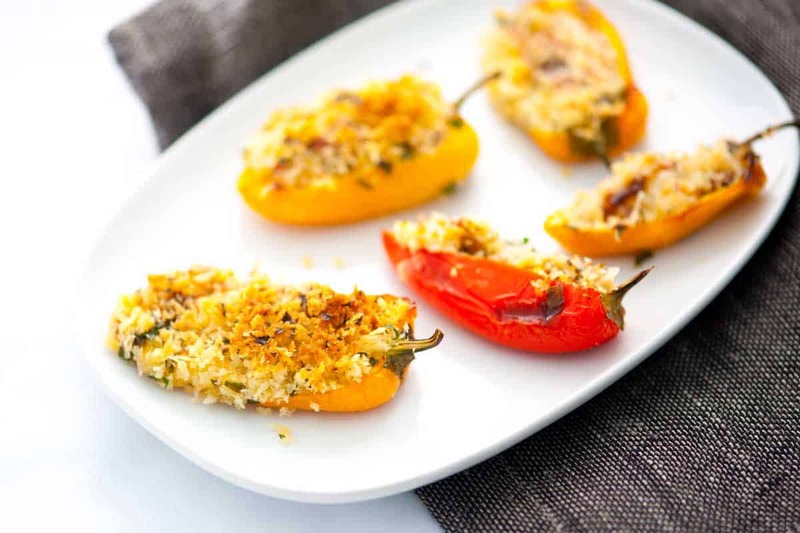 How to make baked mini stuffed sweet peppers filled with cheese and bacon then topped with breadcrumbs. 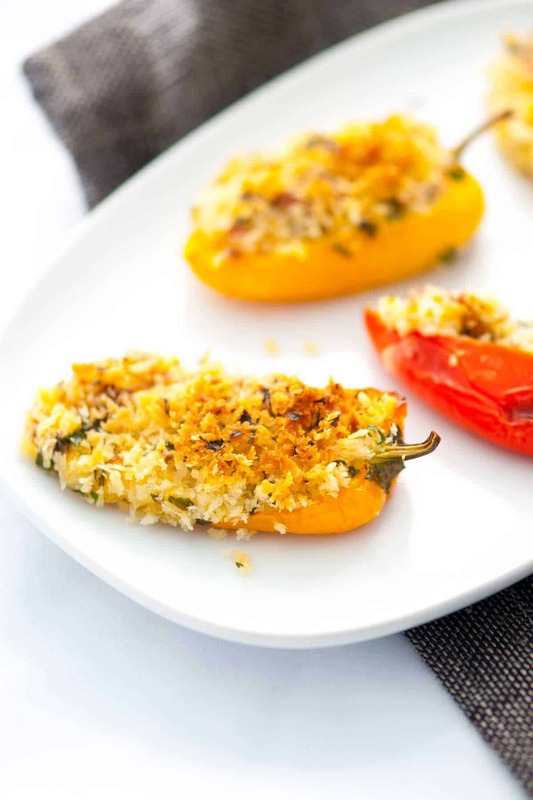 Jump to the Cheesy Bacon Stuffed Mini Sweet Peppers or read on to see our tips for making them. These mini stuffed peppers are a true crowd-pleaser. They are a spin-off from our bacon wrapped jalapeño peppers recipe. If you love spice, jalapeño peppers are the way to go. Spicy food isn’t for everyone, which is why these tame, but incredibly delicious poppers do the trick. 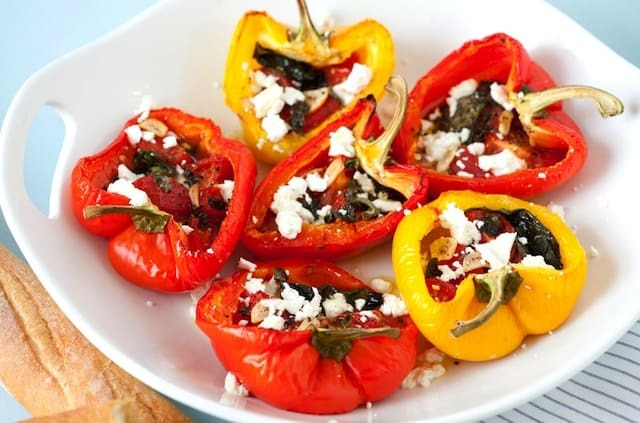 YOU MAY ALSO LIKE: This easy recipe for roasted stuffed peppers with tomatoes, fresh herbs, garlic and cheese. Jump to the Roasted Tomato Stuffed Peppers with Herbs. These stuffed peppers are very simple to make. Mini sweet peppers are becoming more popular in the grocery stores, if you cannot find them, use jalapeño peppers with all the seeds and membrane removed. Or, if you can find them, longer mild Anaheim peppers, which are less spicy (they are light green). The filling is made with cooked bacon, onion, cream cheese, goat cheese and spices. We love the combination of cream cheese and goat cheese, but substituting the goat cheese for feta cheese would also be delicious. Once the peppers are filled, we top them with breadcrumbs and bake until the peppers have softened and the breadcrumbs are golden brown. These oven-baked stuffed peppers are very simple to make. 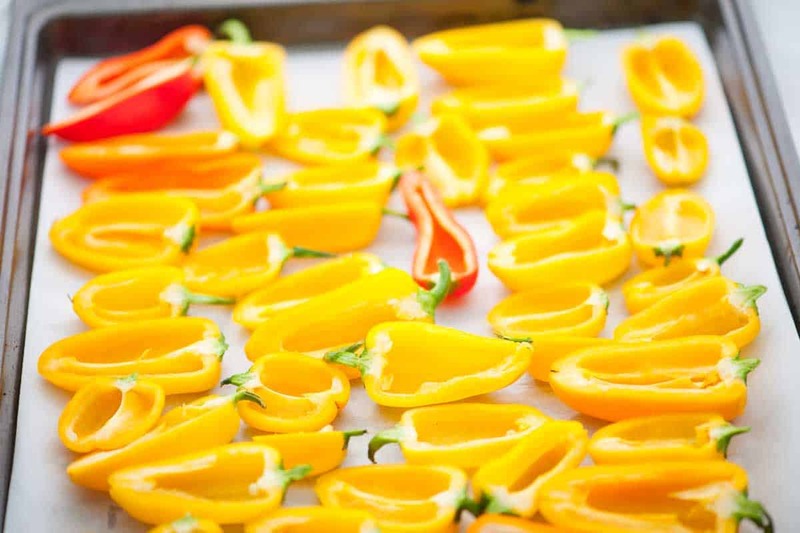 Mini sweet peppers are becoming more popular in the grocery stores, if you cannot find them, use jalapeño peppers with all the seeds and membrane removed. Or, if you can find them, longer mild Anaheim peppers, which are less spicy (they are light green). Heat the oven to 375 degrees F. Line a baking sheet with aluminum foil. Slice each pepper in half lengthwise then scoop out any seeds and membrane to make space for your filling. Cut the bacon crosswise into 1/4-inch-thick strips and add to a pan over medium heat. Cook, stirring often, until crisp. Transfer cooked bacon to a paper towel to drain. Add the onions to the pan used to cook the bacon. 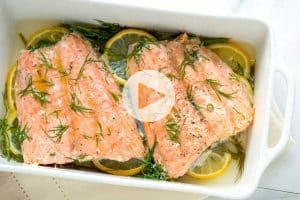 If the pan seems dry, add a splash of olive oil. Cook the onions, stirring occasionally, until translucent. Add the garlic and cook for about 30 seconds. Remove from the heat. 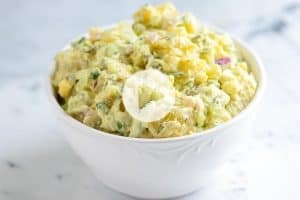 Add the cream cheese, goat cheese, bacon, onion, garlic, scallions, the lemon juice, red pepper flakes, dry oregano, and the salt to a medium bowl. Mix until well blended. Spoon the cheese mixture into each pepper half then place the pepper, filling side down, into the buttery breadcrumbs. Arrange pepper halves, filling side up on the baking sheet. Bake the peppers until they have softened and the breadcrumbs are golden brown, about 20 minutes. Gluten-free breadcrumbs: Try ground gluten-free hard pretzels, brown rice cereal, or gluten-free Chex cereal in place of the breadcrumbs. Just made these for my siblings (biggest critics on the planet) and they absolutely loved them…and so did I! I did not deviate at all. Yum. Me. Make Paleo or keto by using crushed Chicharrones. Just made with feta. Think I like goat better. Tks. Always a hit! Sounds so good. I use petite orange and yellow capsicums. Have done a slight variation on the recipe with incorporating a different mix of herbs and no chilli. (fussy eaters) I have also just stuffed the petite Capsicum and left whole. Am freezing to bake for a girls night a week from now. Am sure they will be awesome. So easy! I made this according to the recipe and other than the lemon I thought it was good. Everyone that had it felt their was to much lemon. It caked for juice and zest of 1 lemon. I don’t have a way of squeezing except by hand, so there was potential for even more juice from the lemon….and I didn’t zest it. Yet it was still way to much lemon. Just throwing it out there for anyone not expecting it to have that much. I am having a Valentine’s cocktail party this Sat. I plan to make the Sweet Pepper Poppers by Adam. How far in advance can I make these and could I freeze them and cook later? 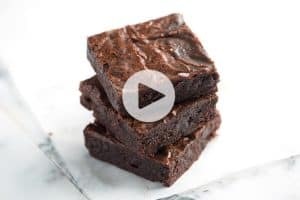 You can definitely freeze these in advance and then partially thaw (for a few hours or overnight) and bake. Easy to prepare, wonderful to munch! Thank you so much! I grew some sweet yellow peppers this season and didn’t know what to do with them. Can’t wait to try this out. Not at all, that is a great idea! You could even freeze them and bake another day. 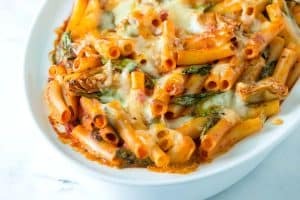 Absolutely adore this recipe! I am part of a close neighborhood, and I shared the poppers when first made, then the recipe due to everyone asking for it! Very tasty! I used turkey bacon for the only change because I do not eat pork or red meat for that matter and a little extra red pepper flakes for an extra kick. The topping I will use again and again on other items, and this recipe is a mainstay in my arsenal for entertaining. Thank you! Nice! We love these poppers so much. Just made these for the superbowl. They were AMAZING! Probably the best appetizer I’ve ever made! Found these on Pinterest – didn’t have all the ingredients, but they still turned out AMAZING! I’m so glad I can make my own poppers now! Hi Jen — so happy you enjoyed them! Made these last night & they were awesome! Used the cheese I had which was cream cheese, shredded mozzerella, & shredded cheddar & it was really good. Also didn’t have breadcrumbs so I used some zatatans fish fry breaking that I had… Gave it a little kick! Delicious! Hi Kim — Love your use of the fish fry! These are so delightful! I was in a hurry so I skipped the breadcrumbs and they are still good. These sound delicious! I have made these before, but I have my own version- brown sausage and drain, mix with 1 brick of cream cheese (or just a little less), stuff the mix into the peppers with the top cut off (and seeded of course! ), then wrap each pepper with a third or half slice of turkey bacon. I sprinkle a little bit of finely shredded cheddar before popping into the oven and they are delicious! I have to say, I DO love the sound of a buttery breadcrumb topping though! Lindsey, we are so glad you liked them!! Thanks so much for sharing. These peppers are beautiful and look SO tasty! Hi Ashley, you are right, this did not rack up a huge grocery bill for us at all, not to mention each pepper you buy, turns into 2 poppers! Thanks for commenting! haha, thats exactly where i got my beautiful peppers. if it werent for them i wouldnt have found this post. i bought them and wanted to find a recipe! great find and they taste incredible. These look super good, and easy. Love it!!! I just bought a bag of mini peppers at Costco and was trying to figure out what to do w/ them, score, thanks! Gorgeous photos, and love the recipe. I made some jalapeño poppers with panko bread crumbs and they turned out so crispy we loved them. these would be great for the people who can’t take the heat. Thanks, Suzanne! These went down well with our family. A few of us love heat, others stumble on black pepper – these are tasty enough to keep everyone happy.